I was born in 1926 in Kursk, Russia. 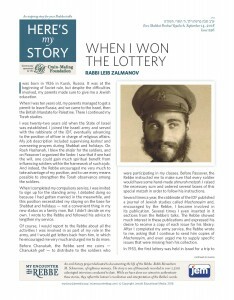 It was at the beginning of Soviet rule, but despite the difficulties involved, my parents made sure to give me a Jewish education. When I was ten years old, my parents managed to get a permit to leave Russia, and we came to the Israel, then the British Mandate for Palestine. There I continued my Torah studies. I was twenty-two years old when the State of Israel was established. I joined the Israeli army and served with the rabbinate of the IDF, eventually advancing to the position of officer in charge of religious affairs. My job description included supervising kashrut and overseeing prayers during Shabbat and holidays. On Rosh Hashanah, I blew the shofar for the soldiers, and on Passover I organized the Seder. I saw that if one had the will, one could gain much spiritual benefit from influencing soldiers within the framework of such a job. And indeed, the Rebbe encouraged me very much to take advantage of my position, and to use every means possible to strengthen the Torah observance among the soldiers.